Karen House : Jan. 29, 2019, 6:53 p.m.
Dr. Winston Pickett, with Marlene Basham, presented a strategic long-term plan for controlled growth at the Jan. 28 meeting of the Sequatchie County Commission. 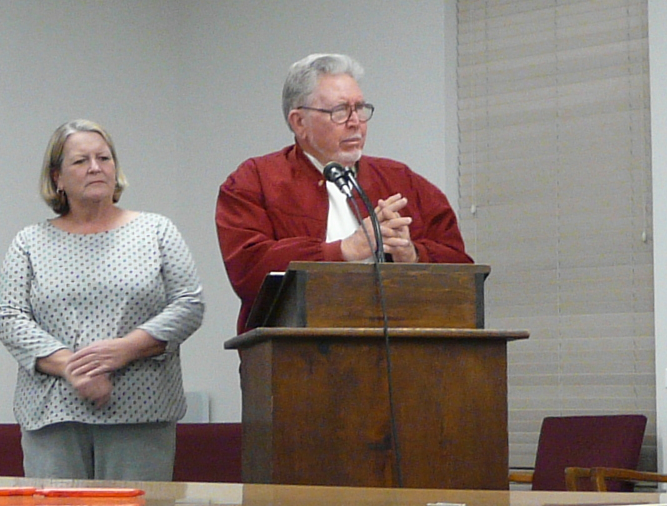 Jan. 29, 2019 – The Sequatchie County Commission voted unanimously Monday night to make a $5,000 donation to MARC (Marion Animal Resource Connection) and give them a certificate of appreciation because of their help in caring for over 100 pets confiscated in an animal hoarding case last October. The night of Oct. 25, 2018, the Dunlap Police Department went to a home in Dunlap, acting on information from state probation officers, and arrested a couple on charges of animal neglect and cruelty. Police Chief Clint Huth recalled that he was “overwhelmed” by the need to relocate dozens of cats and dogs on short notice, and with no local animal shelter, the only place he could call was MARC. Clint Huth wears many hats and was at the meeting in his capacity as county commissioner from the 7th District. Comm. Jeff Mackey commended MARC for contributing “significant amounts of material and personal time” in setting up a temporary shelter in the old zipper factory on Cedar Street, taking sick animals to get attention in Chattanooga, and finding people to adopt or foster home the rescued animals. 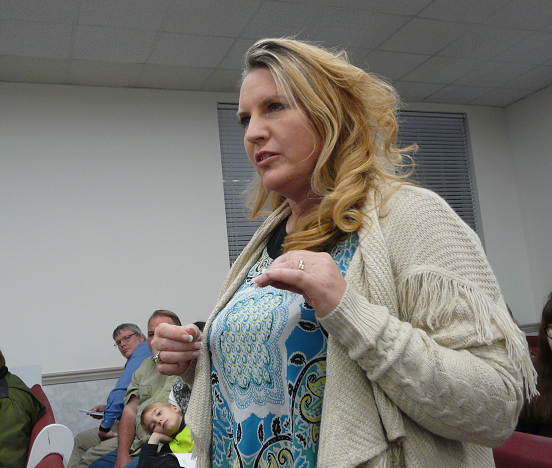 April Bowden, who serves as director of operations for the all-volunteer organization, stood and thanked the commission for the donation, but pointed out that there is no animal shelter in the Sequatchie Valley, only volunteers who are willing to rescue and provide temporary housing for stray or rescued animals. In the current month alone, MARC has received 30 animals from Sequatchie County so far, Bowden said. Comm. Mackey also addressed the commission on behalf of the Emergency Services Committee, to update the board on negotiations for ambulance service. The five-year contract the county currently has with Puckett EMS is due to expire April 30. The committee received contract proposals from just two companies – American Medical Response (AMR) and Puckett, Mackey said. While the proposal from AMR “did not address specific concerns that we had,” Mackey said, Puckett prepared a detailed package that offered several concessions. “One of the top things we wanted was reducing the contracted time of arrival,” he explained. Under the present contract, an ambulance is supposed to arrive within a window of 25 minutes (rural) or 15 minutes (urban). The committee requested those times be brought down to 20 minutes (rural) and 13 minutes (urban). Puckett agreed to the reduced response time. They also offered to provide two 24-hour ambulances, instead of one, plus the 16-hour ambulance, and an added one on an eight-hour shift. Because the contract with Puckett EMS is set to expire in April, the commission voted for a temporary 60-day contract extension, to align the contract with the county budget, which will be adopted July 1 for the 2019-20 fiscal year. They will take Puckett's proposals under consideration when they prepare the new budget. Among the priorities listed for future growth were: Improving health, working together with the city of Dunlap, tourism, traffic, working with surrounding counties, retail development, and purchasing property for future development. Transferred funds as recommended by the Budget Committee – $5,000 to contracted services, $20,000 to jail medical insurance, $3,600 to maintenance medical insurance, $2,500 to County Clerk office supplies. Voted to sell at auction 3.5 acres of rail spur on some vacant property the county purchased last year on TN 28. Passed Resolution #726 for Register of Deeds Kendra Boyd, requesting that the county's commission on fees – which had been reduced as part of state budget cuts – be restored. Passed Resolution #727 applying for a $315,000 Community Development Block Grant to improve housing for senior citizens, which requires a $47,000 local match. April Bowden, director of operations for MARC (Marion Animal Resource Connection) addresses the Sequatchie County Commission. Appointed Ronnie Hitchcock to the county Beer Board. Approved a letter applying for the Three-Star designation. Heard County Executive Keith Cartwright report that a projection of the 2020 Census indicates “good, controlled growth” in Sequatchie County of an additional 3,500 residents since the 2010 Census, which showed a population of around 14,800. Surplused equipment and vehicles, at the request of county Roads Supervisor Eric Higgins, which will be sold at auction Feb. 23. Heard Sheriff Coy Swanger report that the county received a $29,375 no-match grant from the state that will upgrade X-ray machines and walk-through scanners for the court system. Heard Will Pitt submit the activity report for Puckett EMS, which included news of two CPR classes they had conducted in Sequatchie County and two new AED's placed locally. A group of sophomores from Sequatchie County High School (SCHS) attended the commission meeting as part of their Youth Leadership Class, to learn about the workings of local government. They led the assembly in the Pledge of Allegiance. All members of the Sequatchie County Commission were present at Monday's meeting except for Brian Ruehling and Tommy Johnson. All votes were unanimous. The county commission meets quarterly in the upstairs courtroom at the Sequatchie County Courthouse, on Cherry Street in Dunlap. The next meeting is scheduled for April 15, beginning at 7 p.m. CST. All county meetings are open to the public. Sequatchie County Extension Agent Sheldon Barker introduces the high school's Youth Leadership Class to the county commission.